It was 125 years ago when a locally owned electric company first fired up its generator, burning mesquite logs to bring power to homes and businesses in Tucson. Fast forward to 2017, and Tucson Electric Power, the direct descendant of the wood-burning electric company, is harnessing solar energy from more than 90 million miles away with massive solar arrays throughout the territory. 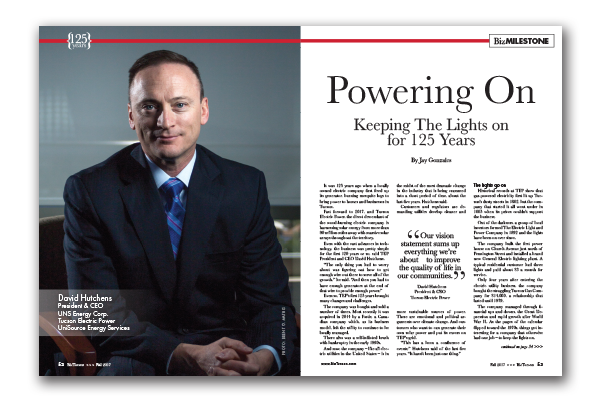 Even with the vast advances in technology, the business was pretty simple for the first 120 years or so, said TEP President and CEO David Hutchens. Even so, TEP’s first 125 years brought many changes and challenges. The company was bought and sold a number of times. Most recently it was acquired in 2014 by a Fortis, a Canadian company which, as its business model, left the utility to continue to be locally managed. There also was a self-inflicted brush with bankruptcy in the early 1990s. And now, the company – like all electric utilities in the United States – is in the midst of the most dramatic change in the industry that is being crammed into a short period of time, about the last five years, Hutchens said. Customers and regulators are demanding utilities develop cleaner and more sustainable sources of power. There are emotional and political arguments over climate change. And customers who want to can generate their own solar power and put its excess on TEP’s grid. Historical records at TEP show that gas-powered electricity first lit up Tucson’s dusty streets in 1882, but the company that started it all went under in 1885 when its prices couldn’t support the business. Out of the darkness, a group of local investors formed The Electric Light and Power Company in 1892 and the lights have been on ever since. The company built the first power house on Church Avenue just north of Pennington Street and installed a brand new General Electric lighting plant. A typical residential customer had three lights and paid about $3 a month for service. Only four years after entering the electric utility business, the company bought the struggling Tucson Gas Company for $14,000, a relationship that lasted until 1979. The company managed through financial ups and downs, the Great Depression and rapid growth after World War II. As the pages of the calendar flipped toward the 1970s, things got interesting for a company that otherwise had one job – to keep the lights on. In 1969, Tucson Gas & Electric became the only company headquartered in Tucson that was traded on the New York Stock Exchange. In the early and mid-1970s, TGE was wheeling and dealing with a number of initiatives. Natural gas shortages and embargoes made coal the primary fuel for power plants in Arizona and New Mexico. The company also entered into an agreement in 1972 to own part of the multibillion-dollar Palo Verde Nuclear Generating Station near Buckeye, Arizona. Amid escalating costs of the nuclear plant and a slowdown in growth and revenues, TGE later decided nuclear was a bad idea for its business and sold its share of Palo Verde to Southern California Edison. With more financial challenges on the horizon, in 1974 the company called on 39-year-old whiz Theodore “Ted” Welp to manage its finances as a VP in 1974. He was promoted to president in 1976, and in 1978 he was named Utility Executive of the Year by Financial World magazine. Welp’s strong hand guided the company through a series of financial deals in the late 1970s. Welp sold the gas division in 1979. “Ted didn’t like the gas business,” Banzhaf said. Two years earlier, the company had gotten regulatory approval to build a state-of-the-art, coal-fired power plant in Springerville, Arizona, that would play a huge part in the company’s near bankruptcy in the early 1990s. A series of complicated transactions and spinoffs related to the Springerville plant and the company’s generating resources put TEP in dire financial straits by the late 1980s. The lights stayed on but the company’s finances were a mess. TEP’s creditors filed involuntary Chapter 11 bankruptcy petitions against the company in June 1991. Charles Bayless had been hired as CFO in late 1989 and was named CEO within a year to lead TEP through its financial workout. Bayless was fresh from leading Public Service Company of New Hampshire out of bankruptcy and his experience was needed at TEP. The first order of business, Bayless said, was to regain the support and confidence of employees, the community, regulators and business leaders to keep the company from formally going into bankruptcy. But 25 years later, Bayless said he always had confidence the bankruptcy would not actually occur. A positive outcome of the near-bankruptcy, Bayless said, was that it set the company on a course to address a wide range of issues – financial, cultural and in the community – to restore its financial health and regain its leadership role as a strong and stable Tucson business, where it stands today. Hutchens, the TEP president since 2014, arrived at the company in 1995 unaware of the financial troubles it had been through. Hutchens had graduated from the University of Arizona in 1988 but left town when he joined in the Navy. Likewise, TEP’s current chairman of the board, Bob Elliott, had been in Tucson since he arrived to play basketball at the University of Arizona in 1973, and he said he was oblivious to the company’s financial troubles because when he flipped the light switch, the lights came on as expected. But it’s a whole new game for both Hutchens and Elliott as they steer TEP through some of the most dramatic changes in the history of the electric utility industry. Planning for growth and increased usage in its service territory once was a matter of forecasting how many people might be moving to the Tucson area, Hutchens said. With advances in technology – including the affordability of solar power – it’s not so easy anymore. “We love to plan. We love to know where our resources are going, and to be able to tell how to get electrons from here to there,” Hutchens said. But much of the predictability went out the proverbial window as new technologies for air conditioners, appliances and other electric products reduced the amount of power being consumed by each product. Customers had more items powered by electricity, but they weren’t using as much power, Hutchens said. Advances in solar technology have created complex issues such as how to charge customers who install solar power at their homes and expect to be able to sell their excess power back to the company using TEP’s wires and facilities. Arizona utilities and the Arizona Corporation Commission are trying to sort that one out. There’s also the complicated task of keeping up with the demand to develop clean, renewable energy, a task that is finally starting to make financial sense for the company which produced 11 percent of its total retail electric sales last year from solar energy resources that it owns and energy that it purchased. TEP owns 56 megawatts of solar capacity with its largest arrays in Fort Huachuca, Springerville and at the University of Arizona Tech Park in southeast Tucson. Hutchens said a utility has to do more than keep the lights on. The company continues on the philanthropic course set during the financial recovery with millions of dollars and thousands of volunteer hours streaming into the community.